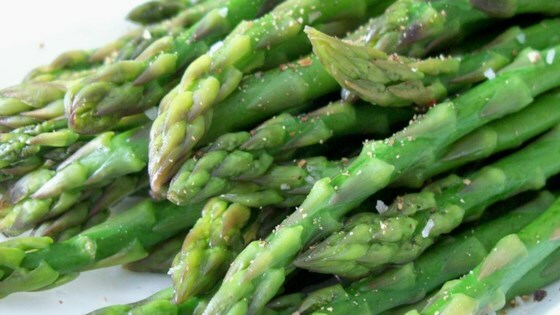 "Makes even tough asparagus, tender and tasty! Try using vinaigrette dressing in place of the butter too." A quick, easy, and foolproof method for preparing asparagus. If you do not have a steamer pan set, you can use a steamer basket inserted into a large pot. It's a total waste of butter to add it to the water. Add it to the finished product. Great! My first time making steamed asparagus-- I had no idea how long to steam. This recipe really helped. Exactly as the name states. I used "dill vinaigrette" (from this site) instead of the butter. Basic, but good. Thanks Kim. I love vegetables with absolutely nothing on them, so this recipe was for me. The asparagus turned out beatifully, not to mushy, not to bland. I'll use it again! Simple and tasty! It is also good for steaming a large bunch to snack on cold at a later time- not too squishy.